In InLoox PM, you can configure finely structured and freely definable permissions. So, you can clearly define responsibilities and make sure that only authorized users gain access to sensitive data. You can set permissions in InLoox PM Workgroup and Enterprise Server in the InLoox PM options. InLoox PM is delivered without permissions being set. So, every user can see and change all permissions. This might be a security risk. In InLoox PM, you can select role-based and user-based permissions. Role permissions are defined according to the function carried out by each person involved in the project, be it as project manager, team member, customer, partner or any other activity. InLoox PM then assigns the correct permission to each person assuming a given role. User account oriented permissions apply to all projects. This allows, for example, company management to look at all current and concluded projects, whereas practical responsibility remains in the hands of the project manager and team. User account oriented permissions require a Windows Server with Active Directory or InLoox PM contacts. Role permissions additionally require Exchange Server. Under Permissions, click Permissions. On the right side, you see the Permissions section. Permissions based on Windows and InLoox user accounts. Active directory accounts (in domain mode) and local Windows and InLoox user accounts (in workgroup mode) are supported. Apply across all projects and on the entire database. InLoox PM does not support Windows groups at this time. Users acquire permissions by assuming a role in a project. Project members are all persons who are listed in the project on the Management page as "In Charge". Possible roles: Project manager, Team member, Customer, Partner, Other. Microsoft Exchange Server or InLoox contacts are required. Persons are identified by their Windows or InLoox Security Identifier, or SID, and the Windows X400 address, or Exchange address. Persons with the same X400 address have the same role-based permissions in InLoox PM. If this is not what you want, please deactivate the role-based permissions entirely by removing all permissions for all roles. The role "team" may "read projects " and "read budgets". All other roles are ignored for the sake of clarity. The user account "Gordon Newman" is authorized to "edit projects " and "edit budgets". For more information about permissions, see List of permissions. "Gordon Newman" is part of the "team" in the project "Product Development"
There are three other projects in which "Gordon Newman" is not involved and therefore does not have the role "team"
He may read and edit the project "Product Development". He may also read and edit budgets in this project. 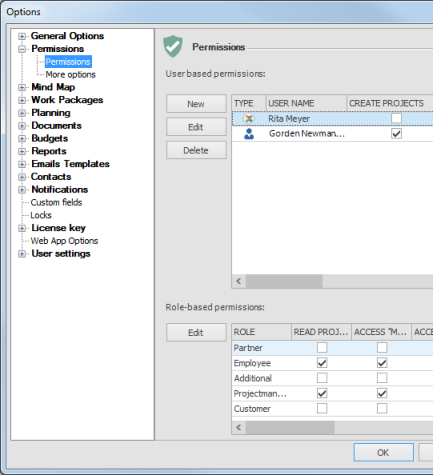 Gordon Newman has these permissions in all projects in which he is in the team role. "Gordon Newman" cannot see any projects in which he is not a team member. He does not have the permission to "read projects", which is a prerequisite for all other permissions. Thus, Gordon Newman has no permissions for any other projects. They may read the project "Product Development" and read, but not edit budgets. They do not have the permission record of the account "Gordon Newman". Persons who are team members in other projects than "Product Development" can see, in contrast to Gordon Newman, a number of projects, but may not edit any of them. InLoox PM permissions are very flexible and allow a wide variety of scenarios to be covered without high administration effort. If you have questions on the assignment of permissions, we will be pleased to help. Our contact information can be found under Contact on the InLoox web site. Set permissions for a user In the User-based permissions section, click New. In the Permissions dialog box, click the Arrow to select the user. Choose from the drop-down list between Active Directory user, Exchange user or InLoox PM user. In the Select User dialog box, click Object Types. You can also use this button to open the Select User dialog box. In the From this Location box, click Locations and select Entire Network. Click OK. Type the required user name into the Enter the object name to select field. Click Check name. A user name that has been recognized by Windows is shown underlined. Click Advanced..., if you need to search for a user name. In the Select Contact dialog box, select an address book and then the respective name from the list. Click OK. In the Select Contact dialog box, use the feature Search by Skill. For more information, see Assign skills to resources. In the Select Contact dialog box, select an InLoox PM address book and then the respective name from the list. Click OK.
For more information on how to create an InLoox PM account, see Create an InLoox PM account. Select the permissions for the respective user from the Permissions list. Edit user permissions Choose one user from the list and click Edit. Click OK after you have made all changes you want. Remove user permissions Choose one user from the list and click Delete. Role-based permissions are only active if there is at least one user-based administrator permission. In the Options dialog box, in the Role-based permissions section, click Edit to change the selected role-based permission. Select the permissions for the role from the Permissions list. Legal Terms InLoox 9 | End-User License Agreement | InLoox, Inc.
Set user permissions | InLoox 9 for Outlook • Copyright 1999-2019 © InLoox, Inc. All rights reserved.